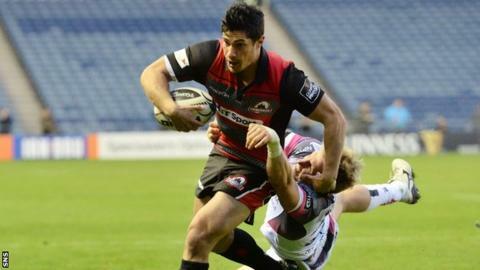 Edinburgh made it three wins out of three to go top of the Pro12 and consign Ospreys to a third defeat. Sam Davies knocked over three penalties to give the visitors a two-point advantage at the break, Phil Burleigh getting a converted try for the hosts. Greig Tonks' kicking turned the scoreline in Edinburgh's favour, with the Scottish side enjoying more territory in the second half. And John Andress crossed to open up a more comfortable lead. Alan Solomons' side move on to 12 points in the division along with Glasgow Warriors' victors Munster while Steve Tandy's Ospreys have only a single losing bonus-point from their opening three fixtures. The Welsh region had the momentum for much of the first half and, as consequence, were awarded several penalties. Davies was unsuccessful with two of his opening four kicks and Edinburgh gradually gained the initiative. A driving maul from the home side may have resulted in a try but television replays were inconclusive. Edinburgh maintained the pressure, though, and Burleigh broke free to touch down right of the posts, Tonks converting. However, the hosts infringed almost straight away and Davies sent Ospreys in ahead at the break. Tonks' first penalty early in the second half swung the match back in the hosts' favour and he added another after a period of Edinburgh dominance. Solomons' men almost crossed again when Roddy Grant tried to off-load to Chris Dean but the ball went astray and Ospreys recovered. However, the second try was not long in coming as Andress broke off a maul to ground and Tonks' replacement Jack Cuthbert converted. Ospreys head coach Steve Tandy told BBC Wales Sport: "In the first half I thought we stuck to the plan pretty well and came in at half-time (in the lead), but Edinburgh got a bit of a stranglehold on us second half. "We conceded some cheap penalties and a second yellow card, and it doesn't help when you're away from home and up against it. "It's really tough for us (without World Cup players), losing people like Ashley Beck, De Kock Steenkamp and Gareth Delve with injuries as well. "That's the way it is, we'd want to win a few games more and I thought we were dreadfully unlucky against Munster at home. We've just got to keep working hard and get this younger group better and learning from experience." Edinburgh: Tonks, Brown, Dean, Strauss, Hoyland, Burleigh, Kennedy, Sutherland, Cochrane, Andress, Bresler, McKenzie, Coman, Grant, Du Preez. Replacements: Cuthbert for Tonks (73), Dell for Sutherland (49), Turner for Cochrane (77), Berghan for Andress (77), Watson for Coman (49). Not Used: A. Toolis, Fowles, Johnson. Ospreys: D. Evans, Dirkson, Spratt, John, Howells, Davies, Leonard, Smith, Parry, Arhip, Ashley, Thornton, Bearman, Underhill, Baker. Replacements: Jenkins for Spratt (67), Habberfield for Howells (75), Bevington for Smith (67), Otten for Parry (67), Griffiths for Arhip (77), Bernardo for Ashley (75), Boladau for Bearman (74), Cracknell for Underhill (45). Sin Bin: Smith (31), Cracknell (62), Parry (67).